Technology has had a massive impact in the way that people can watch and analyse formula one. Technology have certainly made Formula one much more interesting as a sport. 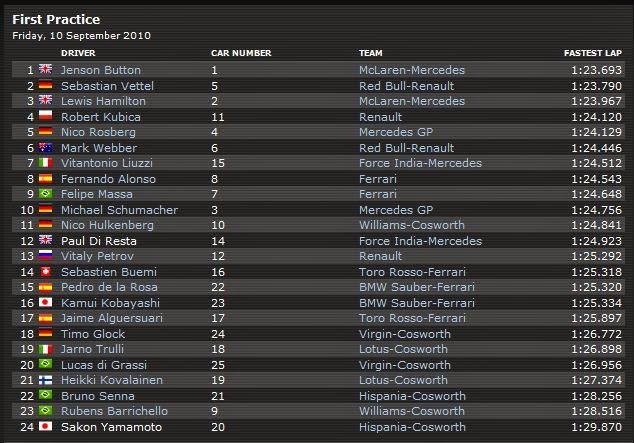 In the pictures attached, you’ll be able to see that the times of all the drivers which are posted in chronological order from fastest to slowest, with the name of the driver, their team and the car number all beside the person’s time. This makes it very easy for viewers to follow who is quickest and by how many seconds. 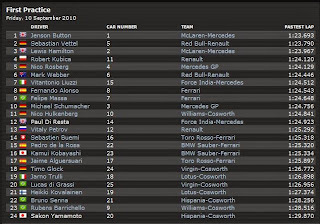 It is a very useful computer program that is used to give a visual picture of each F1 car and the position they are in. This is very useful as we can see the distance that is between each car, it also gives us what tires the car is wearing, as well as their current lap times. However technology has not only improved formula one for the viewers, it has also made big advances that has helped the drivers and mechanics produce faster, more efficient cars. If we just look at the other picture of the driver’s steering wheel we will be able to understand that. They have so many options at just the click of a button. It’s certainly a lot more advanced and more complicated than your normal every day car anyway! There are options for leaders and mechanics to constantly get real-time data like how much fuel their driver’s cars have left, the condition their tires are in, and if there’s rain expected in the next couple of minutes or so. All these components are vital for a team when deciding when the driver should make their next pit stop. Another big advance made in formula one is the driver’s ability to communicate with his mechanics and team leader back in the pit lane. This is vital because it enables them to communicate to say if there is a problem with the car, or if they need a pit stop or anything. It also allows the team to tell the driver how far behind/ ahead he is of the cars near him.